Would you like to hear about another great pattern? Or perhaps you would like to hear about two? Of course you do! Well a little bit ago I was accepted into the Whimsy Couture tester group. 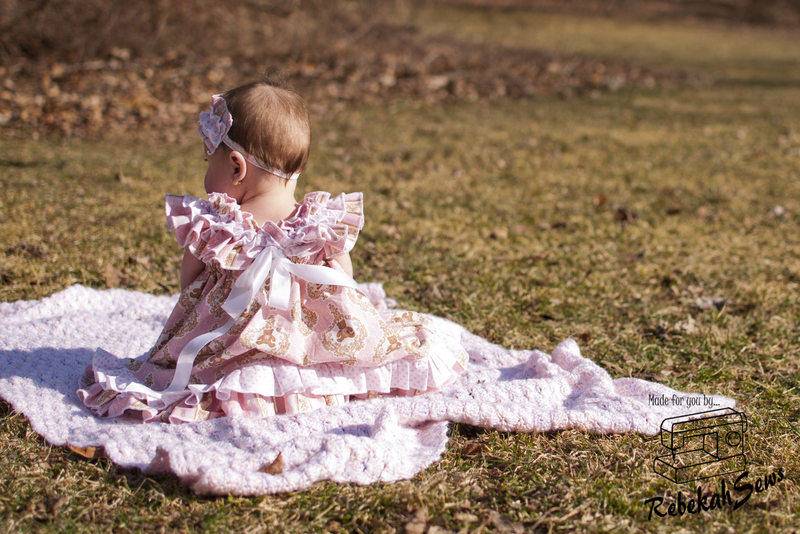 Now if you haven’t heard about Denise of Whimsy Couture then you need to be directed to her new website HERE! She has some really great patterns and even some for boys too! The cuteness factor is beyond belief. But these patterns don’t just stop at cute. There is timelessness about them too. The first pattern I tested was the Boys Diaper Cover. Now don’t let the name fool you. It’s not just for boys. It is sized 0months to 2T. It has elastic in the waist and legs. There is also plenty of room for the cute cloth bums too! Now my favorite feature to the pattern is the bias hem on the legs. Love incorporating more than one fabric, of course that is up to you, but I think it gives it that extra POP! Now the second pattern I just finished testing is, well, just amazing!!! 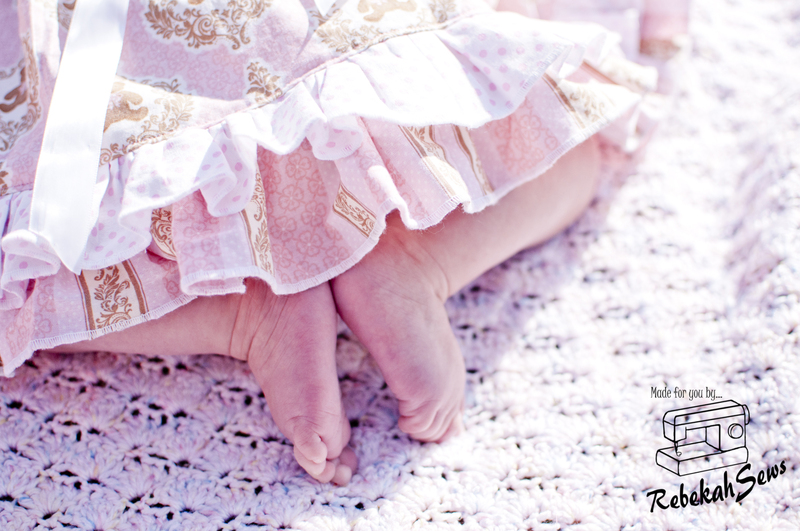 It is called the Sweet Baby Doll Dress and it really is very sweet. 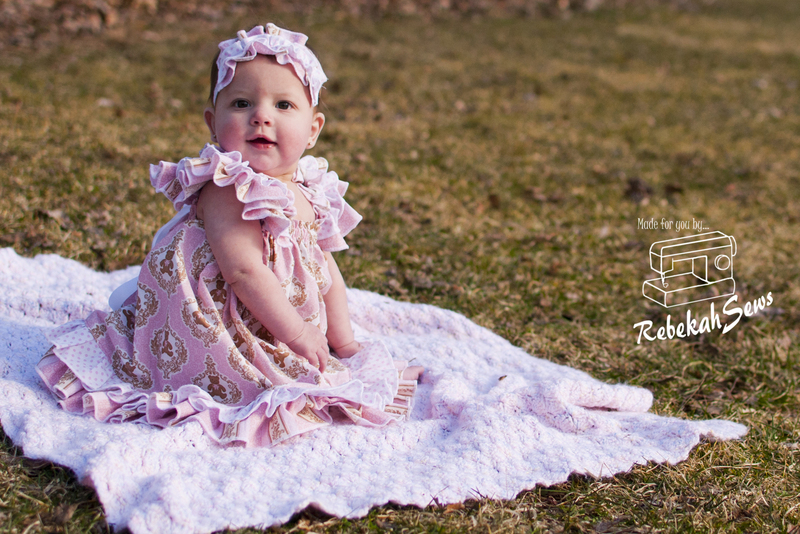 The pattern size ranges in 0months thru 12girls so all your little girls sizes are covered. And this really looks just amazing on babies and bigger girls alike. Now looking at the photos you may be thinking, do I really have time for this??? Um, YES!!! Despite all the ruffles, it really doesn’t take long to sew. The longest part is doing all the rolled hems! Second longest part is putting the ruffles on the bottom hem on but even that didn’t take too long. I think this dress took about 3hrs from start to finish and that included interruptions from the kids. Now as you can see there is a two layer ruffle on both the sleeves and hem. Now if you don’t like the full sleeve look, there were a couple testers that put lace as the top ruffle layer. This created a less full look without losing any of the elegance. The sleeves are quite deceiving because you don’t actually ruffle all that material!!! Did I hear sighs of relief?? There is a casing in the sleeve where the satin ribbon is inserted and then sewn down in the front. After the sleeve is sewn into the main body of the dress the sleeve then becomes adjustable and can be lengthen or shortened with the ribbon which ties through a loop on the back (or front as it can be reversible). 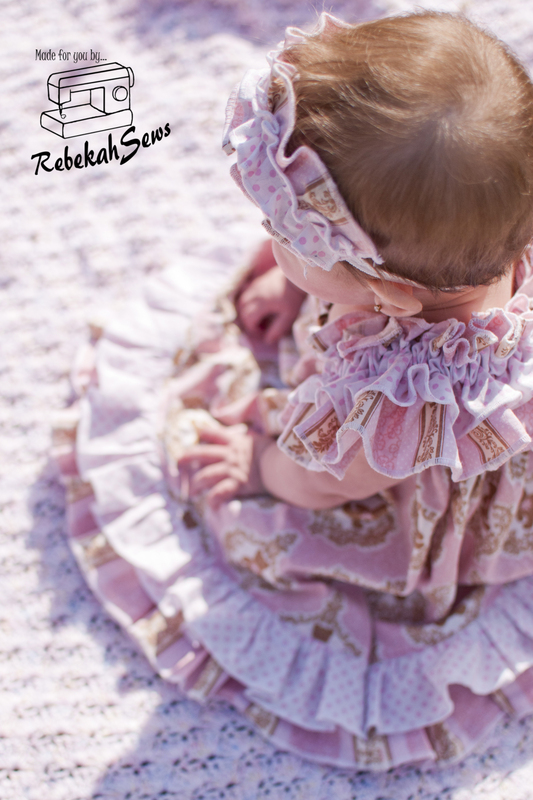 Then make a delicate bow and you have the sweetest dress around! 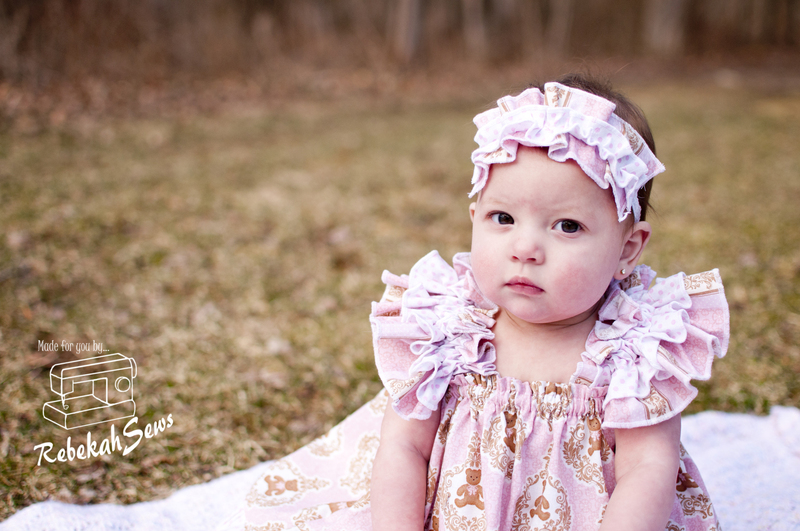 I may be a little biased but it is extremely sweet on my sweet little baby doll! Now I made this dress a little extra sentimental for myself. To me this will be an heirloom for my girl. If you noticed the main dress fabric has little bears on it. I found this fabric and its coordinates at Joann Fabrics when I was pregnant with her and have been saving it for an extra special project. I knew this was the dress for it! Bears are my daughter’s animal. My mom has an animal for all my children and usually gives them gifts around that animal. For both boys that animal is also their favorite animal. Well my daughter is named after my Grandma and she had an extensive bear collection. When she passed away in 2008 every member of the family was allowed to pick however many bears to remember her by. I picked several but loved the pink one seen in the picture with by daughter. I didn’t ever know if I would have a daughter, but if I did she would get that bear and be named after my Grandma. So here she is, but baby girl in her Sweet Baby Doll bear dress, with the bear from her Great-Grandma! All this makes me tear up just thinking about it. So so special! Now that I have gotten a little mushy we shall go back to the pattern. 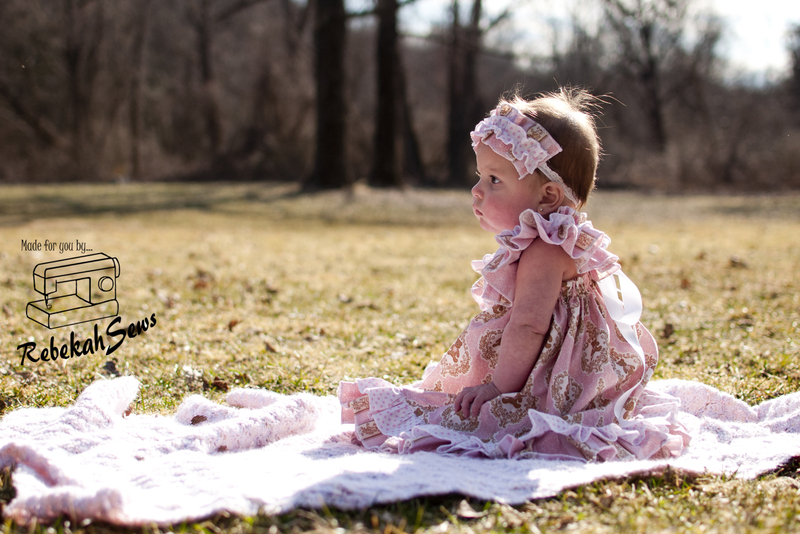 If you would like the Sweet Baby Doll Dress to make that extra special dress for your own girl well I have some great news! It is on sale till tomorrow, Friday April 10th for only $5!!! This is also perfect if you need to make last minutes Easter dresses!!! Working on another tester for Whimsy Couture and it is sure to be a winner too. Have I got you wondering with curiosity??? Well you will have to wait a little longer, but trust me; it will be great for summer too! Have I steered you wrong yet? That dress really is sweet! I just might have to pick up that one. Beautiful! Now see. You went and made me tear up. What. Wonderful gift and legacy for your daughter one day! And a dress and the bear to share with her own daughter one day! You, as always, have done an amazing job. wow, you have a little doll baby. She is so pretty. Beautiful sewing, too. 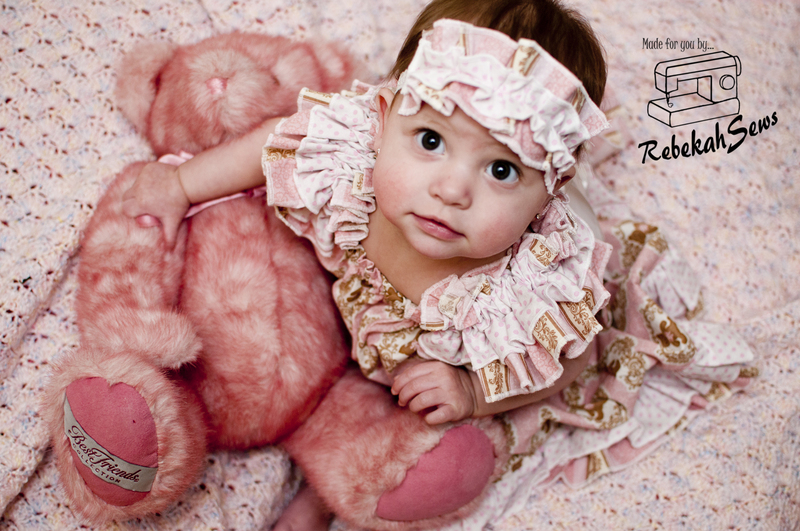 She is adorable, and the dress too – I love the bear fabric, and the story behind it. So awesome that each child has their own special animal.